Every day, Watch This offers staff recommendations inspired by a new movie coming out that week. This week: Identity Thief has us thinking about movie characters operating under false identities. The legendary Hal Ashby was set to direct Tootsie before his erratic ways and substance-abuse problems got him booted in favor of the more dependable, though less inspired, Sydney Pollack. It’s tempting to imagine how Tootsie could have resurrected Ashby’s career and halted his personal and professional downward spiral: In a perfect world, Tootsie would have sent Ashby rocketing back to the A-list and would fit snugly alongside The Landlord, Shampoo, Being There, and Harold And Maude as one of Ashby’s zeitgeist-capturing social satires. 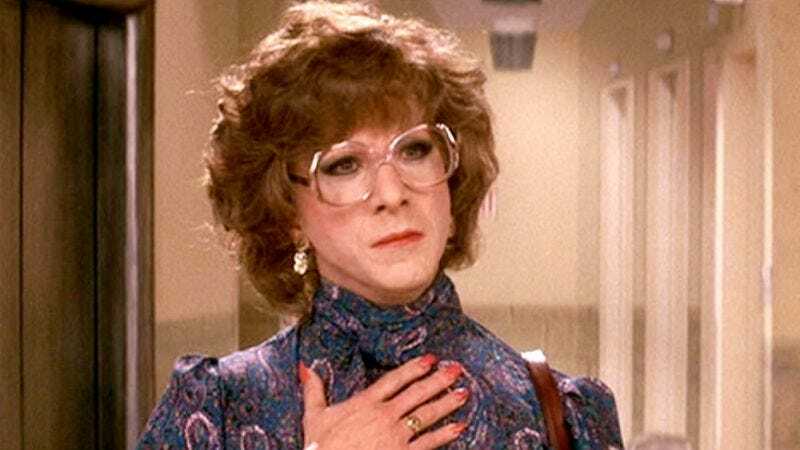 Instead, Pollack steered Tootsie to mainstream glory as a smash-hit blockbuster and Oscar contender about a struggling actor (a perfectly cast Dustin Hoffman, the ultimate actor’s actor) whose perfectionist ways and undesirable physical type (short, middle-aged Jew) have rendered him unemployable. In a fit of desperation/inspiration, Hoffman dons a dress and auditions for the role of a sassy female hospital administrator on a soap opera. Hoffman discovers that he’s an even better actress than he was an actor, and a better woman than he was a man: He’s soon cross-dressing his way to self-actualization and an acting breakthrough, but his guilty secret threatens his newfound success. Tootsie is above all a warped valentine to the craft of acting and the sense of community it engenders, distinguished by a phenomenal supporting cast that includes George Gaynes as a randy older actor, the luscious Jessica Lange in the role that won her an Oscar, Bill Murray as a hilariously pretentious playwright, Dabney Coleman, a young Geena Davis, Charles Durning, and Pollack himself as Hoffman’s incredulous agent. The blockbuster is a smart and loving spoof of the absurdity and superficiality of show-business in general, and acting in particular, that’s also an empathetic exploration of the sexism women must contend with everyday, whether they’re of the genuine variety or just play one on TV. Availability: Not streaming anywhere currently and not on Blu-ray yet, but available on DVD and for digital purchase.